We've been talking recently about vectors and how important they are for designers and the great impact a vector based design can have on an audience. So to follow up and help give you a quick leg-up in terms of getting started with using vectors in your design projects I bring to you the "All Purpose Vector Supply Kit". 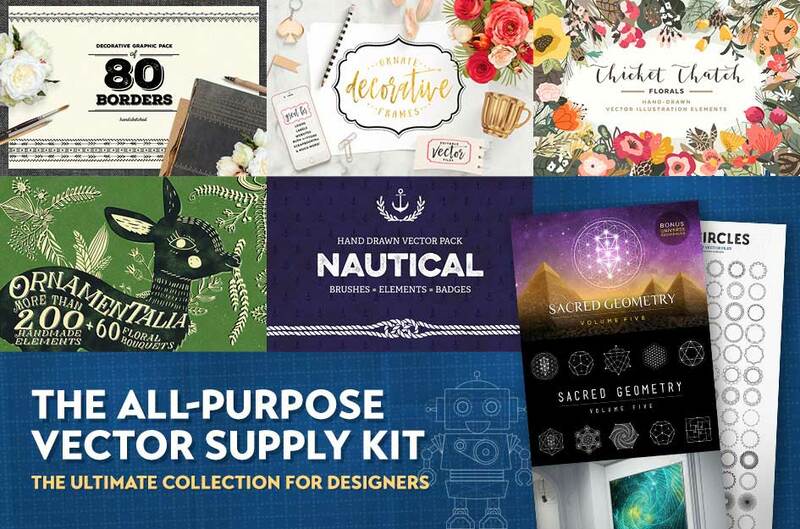 This vector bundle is the ultimate vector toolkit, especially for young designers yet to build up an archive of resources, as it contains vector resources for designs of all types, themes, topics and styles. And the great news is that it is now available for just $29 which is actually 99% off the initial price! Unfortunately this is a limited time offer and expires on Nov 14th at which time it will revert to it;s original $2,800 price! One of the many selection of vector packages within the bundle that may catch your eye is the range of Christmas themed vectors which will certainly be useful for every designer over the next couple of months. 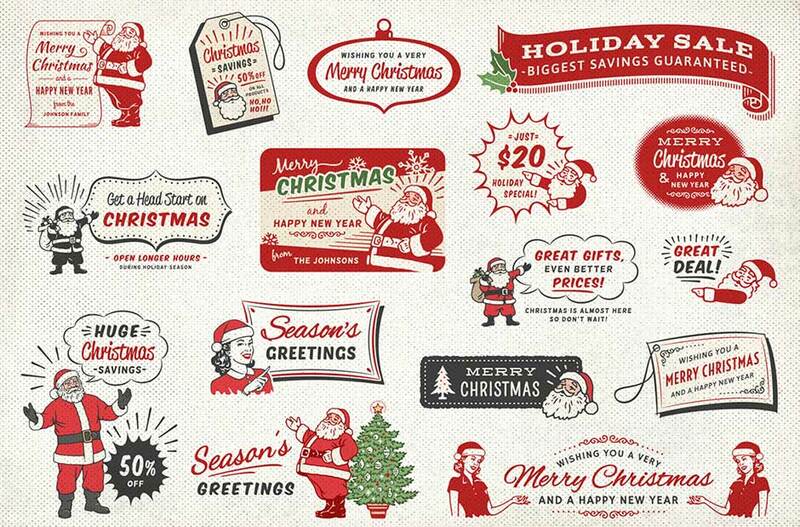 The images below show just a small selection of the huge range of Christmas themed vectors available to download in this bundle. My personal favourite though is the Logo Creator Bundle which has almost 1,000 vectors specifically designed for use in creating vector based logos. It's a must have for logo design projects and is something I have already started using in my own design projects and have really saved me a lot of time already. With over 950 logo related elements and over 100 ready made sample logos it's worthy of a vector bundle all by itself. This vector graphics bundle contains a huge array of logo related elements. Taking everything into account this vector collection brings you an incredibly practical set of elements including frames, florals, icons, badges, shapes, icons, silhouettes, textures, machine parts, artistic markings, sunbursts, labels, borders and much, much more! It’s a complete solution for every designer, so whatever your next project, you’ll be able to dip into this collection and find the exact elements you need! 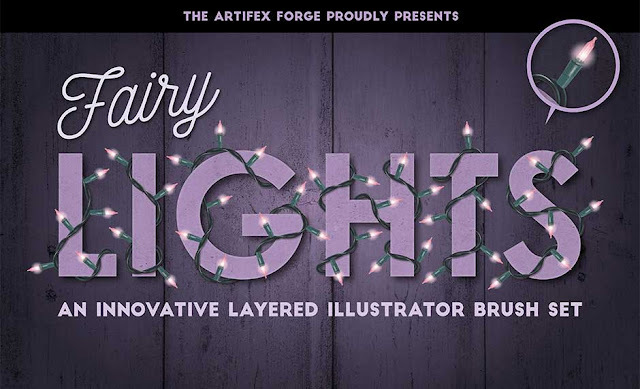 All the components in this vector bundle come with an extended licensing for each and every item, which means that you can use them within your own wider designs available for resale, from greeting cards, to posters and merchandise! So no restrictions, no strings, just quality design elements for you to use. Remember it is a limited time offer (ending Nov 14th 2016), so buy now and it's yours for life.